SriLankan Airlines, the nation’s flag carrier, serves 46 destinations in 23 countries, though it doesn’t yet fly to the Americas. Before joining the oneworld alliance in 2014, the airline revamped its fleet and improved its service. Recent reviews suggest that customers noticed and welcomed the changes. 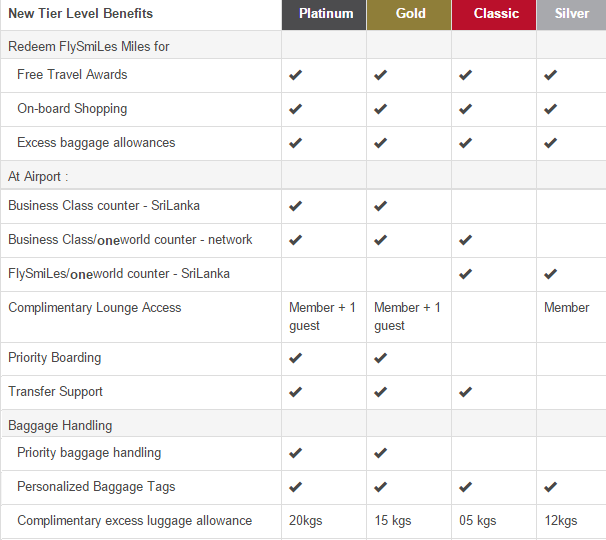 SriLankan Airlines’ frequent flyer program, FlySmiLes, is transparent and easy to use. It has three different award charts: one for SriLankan Airlines flights, another for oneworld members and a third for Mihin Lanka, a subsidiary. The best feature of FlySmiLes is its low redemption rates on domestic routes. If you’re not flying domestic, you’ll generally get a better deal using British Airways Avios, or another oneworld member’s miles, to fly on SriLankan Airlines. How Can You Use FlySmiLes Miles? You can use FlySmiLes on SriLankan Airlines, their subsidiaries Cinnamon Air and Mihin Lanka, partner airline Etihad Airways or with any oneworld alliance member. The best FlySmiLes redemption rates are on domestic routes served by SriLankan Airlines subsidiary Cinnamon Air. Flights within Sri Lanka, where the airline holds a monopoly, can get quite expensive, but award flights cost only 5,000 miles roundtrip. All medium- and long-haul award flights on SriLankan Airlines and its partners are very expensive. On shorter routes, you’ll be better off using British Airways Avios. On longer routes, try redeeming with American Airlines miles. You can use miles to upgrade cash tickets to business class from economy. You can’t upgrade award tickets. One-way upgrades cost 25 percent of the miles required for a round-trip business class ticket. For example, a round-trip award ticket between Sri Lanka and Japan is 170,000 miles, so a one-way upgrade costs 42,500 miles. FlySmiLes has three elite levels: Classic, Gold and Platinum. It also has a Silver level available only to SriLankan credit card holders in Sri Lanka. SriLankan Airlines does not offer a co-branded credit card for U.S. residents.